August 24, 2011 jconradLeave a Comment on Libraries and Subscription TV? Somebody asked me about my interest in food, and I got to thinking about all the foodie TV shows I love to watch. My family watches all of our TV online, and I’ve pretty much had to give up on Top Chef, because it’s been placed rather securely behind a pay-wall. Fox has put Master Chef behind a pay-wall too, but not a permanent one. You just have to wait an extra week to watch online. I’m OK with that. And Fox doesn’t go out of its way as diligently as Bravo does to remove copyright infringing material from YouTube. You don’t have to look as hard to find Fox shows as you do for Bravo shows. Not that I would ever go looking for anything like that, of course! But I began to wonder – libraries maintain subscriptions to magazines, newspapers, and scientific journals. They subscribe to research databases and websites, offering free access to patrons. Are there libraries that subscribe to pay TV services and offer free access to patrons, the way they would subscribe to Ancestry.com? Television access wasn’t such a big deal when you made one payment to one company. You made a choice. Either you watched or you didn’t, and if you chose to watch, you had access to everything that was available in your area. But now, with television becoming available online from many different providers each requiring a separate fee, the library seems like the best way to obtain access to the widest variety of pay TV subscriptions, just as libraries provide access to the widest variety of journal subscriptions. I’m not aware of any libraries offering access to television, beyond circulation of DVDs. But that could be it, I’m just not aware. I think it would be fun, though, visiting a community TV room to watch Top Chef with bunch of fellow foodies. Has anyone else heard of subscription TV at the library? And would you use such a service? I was told, last week, that I’m a preferred paper-cutter. August 20, 2011 jconradLeave a Comment on I was told, last week, that I’m a preferred paper-cutter. It’s a skill, apparently. 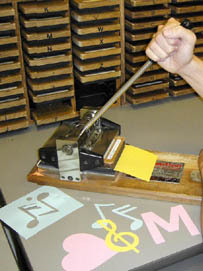 When I started volunteering, I was sort of surprised to see the paper-cutter. I hadn’t seen or used a one since elementary school, and I guess I just kind of assumed they had been replaced by something more technologically snazzy. I’ve known people who scrapbook. I know that fancy electronic die-cutting machines are pretty inexpensive, only about $200.00. Everyone knows the card catalog has gone the way of the do-do. But here are two examples of a library sticking with some pretty outdated technology, even though there’s better and more flashy out there. Of course, these are things patrons never see. But this is an example of one strength that public libraries have in competition with for-profit businesses. Libraries can afford to be more cautious without rushing to fix things that “ain’t broke.” I could be wrong, but I don’t think a business could get away with this. Regardless, I got to wondering, what old-school technologies are other libraries still using? Answer in the comments. for one of my courses already. I’m excited for the semester to start. My books should arrive by early next week. One of the required materials is a book repair kit. How cool is that? August 2, 2011 jconradLeave a Comment on Wish I had known about this sooner. Here’s the schedule. It looks pretty good.